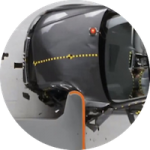 APIC has decided to rebuild its old Crash Test Facility into a new state-of-the-art laboratory, able to perform high speed crash tests (frontal, side, and rear) with vehicles up to 20 Tons, and it will be ready for car to car crash. Thanks to the long experience of ADDITIUM’ team in the design and supply the most advance Full Scale Crash Test Facilities for different speed ranges, APIC will have some of the latest innovations, like our new Nano trolley technology and the new Control system. The lab is expected to be commissioned by this summer. This Project consolidates the presence of ADDITIUM in Asia for the passive safety testing systems, through getting the confidence of this competing market, as a high-quality supplier.